Is the red light in the upper left corner supposed to be on? The red light will only be lit when firmware is being downloaded, or the metronome feature is active and playing. My StroboPLUS HD does not respond when tuning acoustically or the internal microphone does not seem to work. Try cleaning the input jack with a small brush or q-tip lightly dampened in alcohol. The microphone is disabled when a cable is connected to the input jack. The StroboPLUS HD may occasionally mistake any dirt or debris in the input jack for a physical connection. There are reports of virus protection software like Windows Defender, Norton and McAfee blocking Google Chrome from accessing your Peterson product via Peterson Connect. Temporarily disabling these porgrams will allow Google Chrome to read and write data to your device. Please do so at your own discretion. Accessing the Peterson website, then diabling antivirus software immediately before connecting the USB cable is one way to minimize web traffic while your antivirus software is disabled. Enable your antivirus software after receiving updates but before navigating to other websites. I charge my StroboPLUS battery to full but it switches to one bar when I disconnect. Some of the latest run of StroboPLUS tuners ( May/June 2015 ) may incorrectly read the remaining battery life. Our engineers are working on a firmware update to address it. Your battery is actually charging to full in an hour or two but when you unplug, the software doesn't read the remaining battery life correctly. Other than the incorrect graphic, your StroboPLUS will work normally and the battery will last as long as any other StroboPLUS. We will send an email to all registered users when a new firmware update is ready. Update: July 9, 2015 - This issue has been resolved as of firmware update 1.1.6. Peterson Connect - Windows 7 - StroboPLUS HD will no longer connect. Powering off the StroboPLUS HD while it is still connected via the USB cable may disrupt Windows 7 drivers. This can result in the StroboPLUS HD not being detected by Windows on subsequent USB connections. A reboot of yout computer will usually solve this issue. 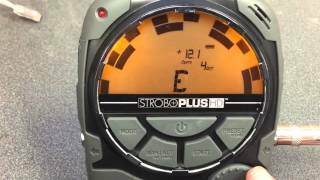 Here's a short video on the basics of using your StroboPLUS HD. 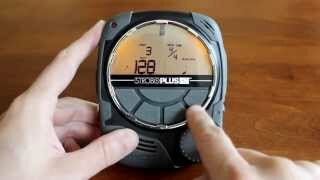 How do I adjust Tempo in 1/10th BPM on my StroboPLUS HD Metronome. While adjusting tempo, press in on the select wheel and HOLD while turning the wheel to the right. This will allow selection in 1/10th BPM. HOLD in while turning to the left to revert to whole BPM selection. What features of my StroboPLUS HD can I configure with Peterson Connect? Customize your tuner's backlight brightness and battery efficiency options..
Upgrade your StroboPLUS HD to include the Body BeatMetronome. I've purchased the metronome upgrade. How do I install it? Installing your purchased metronome requires USB communication with your StroboPLUS via the Peterson Connect add-on for Google Chrome. Once Peterson Connect is installed, connect your StroboPLUS with the provided USB cable and you will be prompted to install the metronome. Click here to read more about Peterson Connect. Fixes Connectivity Issue on Windows & Linux machines. Required for Chrome Peterson Connect v1.2.0 and up. Adds / Corrects offsets to BFB Sweetener for 5, 6 & 7 string Buzz Feiten Bass. Fixes a bug that affects Accent Patterns for Metronome Upgrade. Various offsets for Accordion Sweeteners have been corrected. Fixes an incorrect battery level reading that occurs on units from a recent production run. ( June 2015 ) Otherwise, it is the same as 1.1.4. Update will reset custom configurations but you will be prompted to reinstall your saved configuration immediately after update. The time required for holding the power button in order to shut down has been reduced from 2 seconds to: 1.5 seconds or 0.8 seconds if no edit menus are active. Pressing the select button ( pushing in on encoder wheel ) will increment through each of the parameters until the parameter you want to edit is blinking, then edit the value by rotating the select knob. Some users found this easier than turning the encoder wheel to select a parameter to edit. Both ways work for backward compatibility. Bug fix: If “Preset” was the last selection in Strobe-Tune or Audio-Tune modes, then when first entering Metronome mode, the BPM menu was not locked in the edit menu, as it is supposed to be. Bug fix for metronome upgrade only. The tempo menu will now properly start after a power cycle in either the TENTHS or UNITS menu, based on how it was last used. Fixes a bug that first appeared in versions 1.1.0 to 1.1.2 that did not correctly apply offsets to more than one of the same note in the same octave. Versions 1.0.9 and previous did not have this bug and worked correctly. Corrected offsets for the LA6 sweetener. There are two additional pedal steel guitar Sweeteners added. SH6 & SH9 - Sid Hudson’s settings for E9 and C6. Sweetener value shows for the indicated preset, while selecting a preset. Version 1.1.1 was released concurrently with version 1.1.0 and contains all features from version 1.1.0 listed below. Added 32 Metronome Practice Patterns. These patterns are accessed via the preset button at the end of any user defined presets. Metronome Practice Patterns allow saving a tempo setting for each pattern. Select the pattern, set the tempo and hold the preset button. The right most digit in tempo will go in circular pattern to show that the tempo was saved as part of that preset. There are now 60 additional user defined metronome presets allowed, for a total of 70. Presets wrap upward, but not downward, in all modes. In metronome mode, the settings show for each preset and are implemented immediately as the indicated preset is changed. Earlier firmware versions required you exit the preset selection menu to see the preset parameter values. The “E” (edited) icon is displayed when the current parameter settings do not match the last saved values of the indicated preset, in Metronome mode. The meter parameter display is updated to the first bar of a tempo map when a new tempo map is first selected. A bug in previous versions had displayed the previous value until the bar value changed. A user controlled ROOT parameter has been added for each sweetened tuning (temperaments included) for both audio and strobe tuning modes. Select the sweetener and hold the selector knob in and rotate it until the Note indicator says C which is the default root. Release the selector knob and rotate it to the root note you desire. The Sweetener name will now flash alternating between the root selection and Sweetener. The root will be set back to C whenever you change the Sweetener or restart the StroboPlus, it is not saved. Tympani tuning: “TYM” has been added to available sweeteners. This setting adjusts the strobe pattern to be more readable while tuning tympani drums. The offset for note Bb in temperament RAM was changed from -1.4 to +1.4. This was an error in previous releases. Timeout for editing a parameter is increased from 4 seconds to 8 seconds. Timeout for selecting a parameter is reduced from 4 seconds to 3 seconds. When the backlight transitions from “Active” to “Inactive” levels, it now fades between these levels, instead of an abrupt change in the light level. The timings for switching the backlight from the “Active” level, to the “Inactive” level, have been adjusted slightly as necessary to account for the other changes. Tempo selection in Metronome Mode defaults to whole units and not tenths for BPM. Always defaults to Auto Note detection when Strobe Tune mode is started. Octave icon will NOT show on the display when a custom note name and octave are specified in Peterson Connect. Bug fix for inability to turn on when battery level is too low. Tap Tempo now works with selected Accent Pattern in Metronome Mode. The Voice for the Audio Tune mode is a sawtooth below C7. At C7 and above it uses a sine wave. Pressing and releasing the power button when a Tempo Map is selected will set the bar value to 1. This is a shortcut for getting back to the start. Several changes to the battery charging and battery level indication. StroboPlus can be powered with USB power, even if the battery is not installed. The battery ICON does NOT show if the battery is NOT installed.